While unsuspecting U.S. consumers continue to expect low, sub-2% inflation according to the latest YTD low breakeven rate, little do they know they are about to be blindsided by a coming inflationary shock, according to a new WSJ reportwhich notes that many U.S. consumer staple and industry-leading companies are either already in the process of raising prices, or have set concrete plans to do so in the very near future. Once these price increases are passed through to consumers, it will likely mark the end to a long period of "low inflation" that the Fed has constantly leaned on as an excuse to keep rates low for nearly a decade. Take Clorox for example, which is raising prices on everyday products like cat litter. Coca-Cola also reported higher prices for the past quarter. Mondelez International also plans to raise prices in North America next year according to an interview with its CEO on Monday. The food giant said that it is passing along rising costs, including ingredient and transportation costs, to consumers. Airlines are also passing on costs as they are paying about 40% more for jet fuel than they were a year ago. Delta, jetBlue and American have all raised fees, fares, or both. Trucking costs were up 7% annually in September and private sector wages and salaries in the September quarter rose 3.1%. Arconic was able to widen its operating margins this past quarter on its aluminium products by using tariffs to justify price hikes. Manufacturers are paying about 8% more for aluminium and 38% more for steel than they were a year ago. Looming potential tariffs with China to the tune of $200 billion also continue to weigh on input costs. Even such supposedly immune to day-to-day price fluctuation companies as Apple ,recently raised prices on its new MacBook Air and iPad Pro products by between 20% and 25%. The list goes on: Steve Madden said it would be raising prices on handbags and other products that it imports from China. It’s looking to shift production to other countries to avoid tariffs and said that products made in China could rise as much as 10% in price. An interior designer working for Whiski Kitchen in Royal Oak, Michigan was cited by the Journal as stating that she was paying 15% more for quartz countertops made in China also as a result of U.S. tariffs. She's also paying about 10% more for imported cabinets. Sherwin-Williams and PPG, both in the paint manufacturing business, stated in recent weeks that they would continue to raise prices to cover rising costs for input materials like titanium dioxide. Sherwin-Williams raised prices by as much as 6% this month. Sherwin-Williams Chief Executive John Morikis said last week that "Raw material inflation has been unrelenting and accelerating." 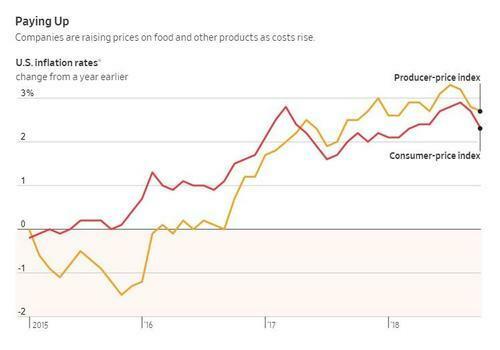 Food companies are also hiking prices. McDonalds' 2.4% SSS comps in Q3 were a result of higher burger prices. Chili's Restaurants raised the price of its two entree and an appetizer deal from $22 to $25 in the quarter. Habit Restaurants saw its prices rise by 3.9% in May of this year, even while traffic declined 3.4%. Hershey also has plans to sell candy in packaging next year that will raise its price per ounce. "Retailers understand that when costs go up, something has to give," said Michele Buck, chief executive of Hershey, last week. "Tariffs are causing inflation: increased costs of imports, increased cost of freight and increased domestic costs from suppliers who import." While inflation still technically remains near the Fed's 2% target, if you believe the CPI number, which as we have discussed previously woefully undercounts true inflation which is as much as three times higher than the Fed's hedonically adjusted, politically motivated number, prices are set to move higher as a result of labor shortages, while headwinds for prices include the recent strength of the dollar, making imports cheaper. And then there are tariffs. It’s obvious that higher prices will "work" alongside the Fed's rate hikes to help dampen the United States economy further. Not only that, but higher prices could cause even more damage if the Fed sees raising rates as the main solution to inflation exceeding its expectations. Diane Swonk, Grant Thornton's chief economist, previewed what will happen next best: "We might see a pop of inflation in the first quarter." 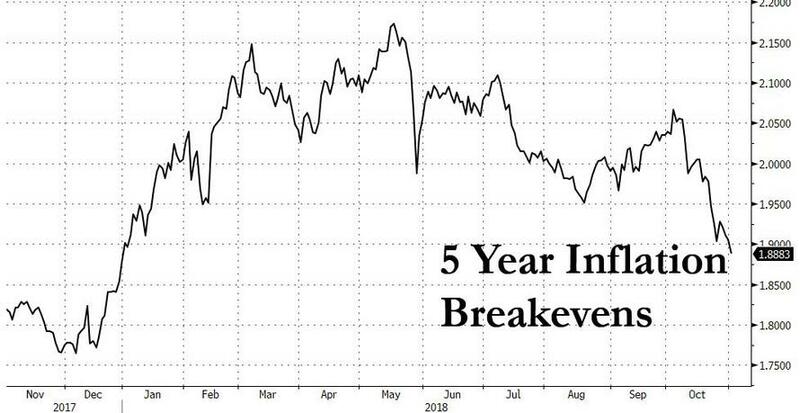 Once that happens in what is already a rising rate environment in which the president has made it clear he is solidly against any more Fed tightening, we wonder just what Powell's next move will be when even higher prices force his bluff?